What do you fancy doing in North Wales? Where will you have your next adventure? North Wales is home to some of the finest adventure providers in the United Kingdom, with experiences ranging from climbing, canyoning, caving, high ropes courses, rafting, go karting and more. Each of these specialist businesses have been accredited for the North Wales Adventure-Map because they are the very best at what they do - guaranteeing you a fantastic day out with memories that will never fade. Whether you live in North Wales, or are travelling here for a day out or a holiday, be sure to make the Adventure-Map your essential guide to the very best things to do! Don't forget that you can download a Print Version of this directory to carry around with you! 55 acres of woodland provides the backdrop for your paintball pleasure. World Famous underground adventure trips in the abandoned mines of Snowdonia! The UK's Highest Continuous Ropes Course! Come and challenge yourself! A small company dedicated to bringing you top quality days out at a reasonable price! Our Adventure-Map is a non profit sign-posting directory website that accredits businesses in North Wales who provide consistently professional high quality adventures to their participants. Businesses listed on the Adventure-Map have not paid for the privilege, they are there because they provide the high standards of true adventure that we expect of them. We use not only local reputation, but also NGB accreditations, licences, trading history and TripAdvisor� feedback to determine if a provider meets the grade to be accredited here. 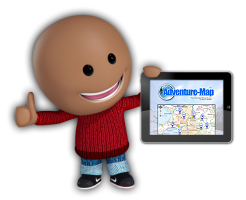 Our Adventure-Map meets the need for a fair, honest and most importantly - inclusive directory of the best providers the area has to offer. It has been set up by Go Below Underground Adventures for the benefit of all local reputable adventure businesses who deserve to be recognised and put "on the map". If your business provides quality, memorable, safe and well-managed adventures in a consistently professional manner then please consider asking us to be accredited on this website. There is no cost for doing so, just the commitment to remain the best in the business at what you do. We would ask you to add a link to the Adventure-Map on your website. To apply please contact Go Below Underground Adventures so that we can assess your suitability and take things forward. Criteria that we are interested in include a well regarded and respected local reputation, long established trading history and/or a strong, credible show of customer approval through TripAdvisor� or similar means.